Friday, September 18, 1914: Nothing to write. Since Grandma didn’t write much a hundred years ago today, I thought you might enjoy this 1914 ad. Pompeian, Inc. is a food company that was founded in Baltimore in 1906 and produced America’s first national brand of imported extra virgin olive oil. Posted on September 18, 2014 March 8, 2016 by SherylPosted in AdvertisementsTagged 1914. And even back then the ad makes a point to say the oil is chemical free! I was also surprised that there apparently were a variety of methods (some of which involved the use of chemicals) used to extract the oil back then. Hard to believe there was nothing to say! It’s nice to hear that you liked the ad. One thing about olive oil has changed…the price. People still love it. 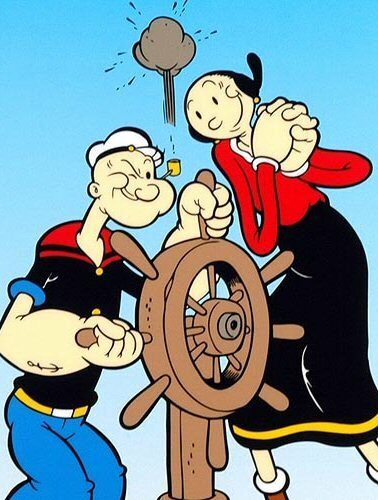 Great picture–I’d forgotten all about Olive Oyl. I, too, was surprised that this product was on the market one hundred years ago. Grandma is chatty one day and quiet the next! There definitely is a huge range between the days when she seemed very engaged in writing something in her diary–and the days when she very obviously was not. My olive oil is in a glass bottle, I wonder what it would be like in a tin. hmm. . . I have no idea. I wonder if the metal would affect the taste. Every time that I purchase olive oil, I try to decide whether olive oil in plastic bottles is of the same quality as olive oil in glass. So they were worried about chemical additives even back then – very interesting! I’ve seen articles in hundred-year-old magazine that discussed the problem of “adulterated” foods–but I don’t remember ever reading anything that specifically addressed olive oil. Would be nice if olive oil was that price today. I agree! 🙂 Of course, inflation accounts for some of the price difference.